I don't think you could grow up in the North West during the 1980s without being aware of Frank Sidebottom, the bizarre but genial musician/comic whose bulbous fibreglass head with its perpetual expression of blank surprise was as much a part of Northern culture as George Formby, Coronation Street and Joy Division, and just as down to earth, enduring and quietly tragic. And yet, in this deft, lovable adaptation of Jon Ronson's book about life or the road with Britain's most famous human cartoon character, it doesn't matter one jot that our enigmatic, driven, creative and ever so slightly bonkers frontman is now American. Nope we're not in Timperley any more – in this fictionalised version of the ultimate spaced oddity, Frank is from Kansas. He and his band Soronprfbs (no, no-one in the film can say it either) are touring Britain, which is where our everyman hero, wannabe musician Jon (Domhnall Gleeson) happens upon them, stepping in to save the day when the band's keyboard player is sectioned after attempting suicide. Undeterred by this unfortunate Spinal Tap-like incident, when manager Don (Scoot McNairy) invites Jon to Ireland to record an album, he jumps at the chance. But while Frank and co. are happy to play strange, spine-tinglingly discordant music reminiscent of Nick Cave singing with the original Alice Cooper band, Jon has stars in his eyes, introducing the band to the world via Twitter and YouTube – unbeknownst to its members, who seem to exist in a 1970s, cigarette-smoke-wreathed, tape-to-tape pre-digital bubble. But a slot at prestigious discovery festival South By South West proves a step too far for fragile Frank (who does, after all have a medical certificate explaining why he can never take his big fake head off) and his wary, introverted band mates, and suddenly Jon is forced to deal with behaviour and emotional instability a million miles from his narrow, suburban comfort zone. 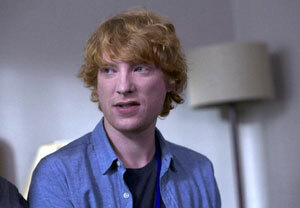 Domhnall Gleeson (better known as Bill Weasley in the Harry Potter films) does a great job in grounding this off the wall biopic (even if we do occasionally want to slap him for his lack of understanding) providing us with a familiar anchor point in the weird and wonderful world of Frank, albeit one that cannot hope to steer or even stabilise the mercurial ship he finds himself aboard. But the film really belongs to Michael Fassbender, who forces Frank's troubled genius to shine even through a thick layer of fibreglass, his every gesture eloquent and fitting. And he is ably abetted by a magnificent turn from Maggie Gyllenhaal, who is simply superb as the glacially bitchy, fiercely loyal, self-styled tragic heroine Clara. While Frank may fret that his music is unlikeable, this film is anything but: a joyous, darkly comedic paean to true eccentricity that both plumbs the depths of human fragility and soars the dizzy heights of creativity, an off-beat love song to anyone who's just too darned weird to be mainstream and doesn't give a damn.